Old Technology: Manual application is labor intensive, time consuming and more expensive. New Technology: Robotic application saves time, material and money. 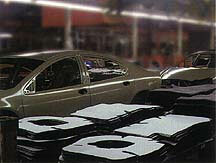 State-of-the-art technology replaces the use of plastic pads in automotive sound deadening applications. PrecisionSwirl T brings sound deadening to a new level. Say good-bye to manually applied die-cuts and mastic pads with Graco's PrecisionSwirl T automated liquid-applied sound deadening system. PrecisionSwirl T replaces melt pads using new liquid dispense materials, resulting in fuller coverage, no gaps and better structural integrity. PrecisionSwirl T includes a state-of-the-art proportioning control panel, patented mechanical swirl applicator, feed system and regulators--ensuring continuous flow and closed loop control. PrecisionSwirl T Easy adjustment for model change, easily applied near a class A finish and high flow rates. PrecisionSwirl T puts the material exactly where you want it, even in tight crevices, so you get less wasted product and no atomization or overspray. 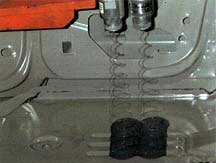 Put a PrecisionSwirl T system anywhere in your plant, not just in a ventilated paint spray booth. Better control and accuracy means fewer warranty issues, water and air leaks. And because materials stream from the large PrecisionSwirl T orifice, there's less tip wear, which means more consistent patterns and less tip plugging.